We arrived home 30 minutes early. The Vienna City Airport Train worked well and we were able to check our bags right through to Ottawa. There was a minor problem with Mary's ticket - the sort of thing that only the check-in staff know - and fix. Making the transfer in Frankfurt was harrowing because there were few signs telling us where to go. Airports are the worst part about flying but aircraft are not much better. We both feel very tired today. 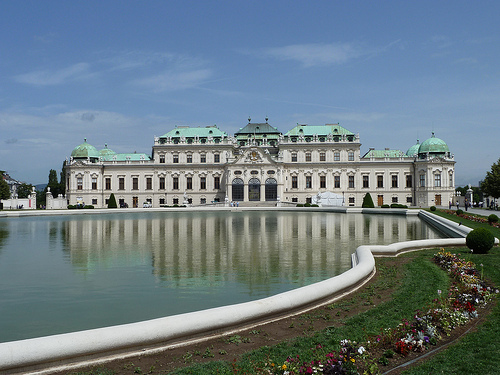 We have come to realize that there is a cumulative effect to all this traveling and now that our objective has been achieved all we have to do is to get back to Vienna - and sleep. The first duty in the morning was to do a moth patrol to liberate all the prettily patterned insects that had found their way into the room. We had a good breakfast, much of it spent with Alex, who is currently at Glasgow University. The taxi had been booked for 0930 and he arrived precisely on time - to the second. He took us to the Bad Waltersdorf station and then we argued over the fare - he only wanted 2 euros and we though that was too little. In the end we gave him 5 euros and he took it but said "That is too much". 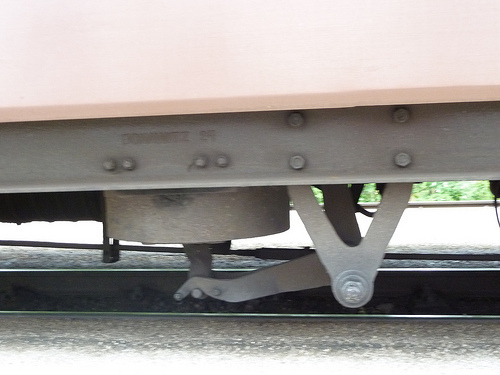 While waiting for the train I took a look at the rail fastenings. Four lag screws for each tie plate with the rail being secured by two nuts with spring washers. The ties all had date nails in them - they looked to be 04 or 05 which is very recent. The train arrived just a couple of minutes late and we made the transfer to the bus and back without incident. Easy when you are expecting it. 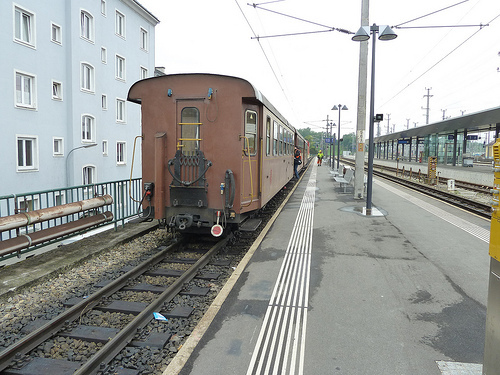 We finished up abut ten minutes late at Wiener Neustadt and caught a local Wiesel train into Vienna. This proved handy as it not only went to Wien Meidling but also Wien Mitte which is only one stop on the U-bahn to Swedensplatz. I was surprised to see the men working on the roadway today, a Sunday before a holiday. 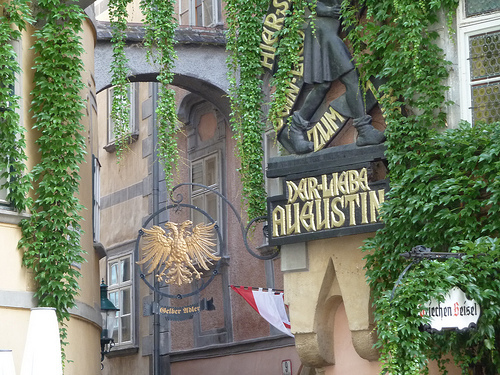 Lunch was Wiener Schnitzel/Boiled beef and beer. Have now checked in with Air Canada. Supper was a hot dog from a wurstel stand. Take a roll, cut a small piece off the end and shove it on to a stainless steel spike to hollow it out. Fill it with mustard or ketchup, or both and then shove a wurst into it. Dessert was at the ice cream parlor at Schwedenplatz where they serve an amazing variety of sundaes and other ice cream based treats. 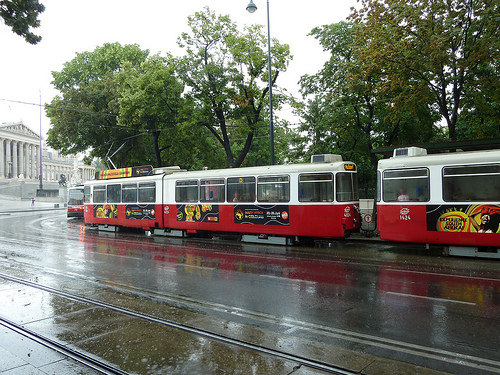 Click below to see my pictures of Vienna trams. It was pleasant knowing so many people at breakfast. We had a long talk with Oleh and Elfi who were looking after their brand new grandson. The walk into Sebersdorf was interesting. 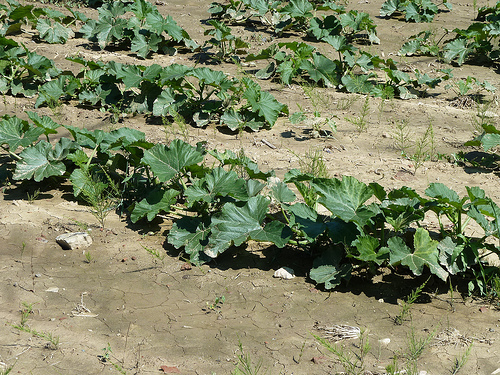 There were many cherry trees in fruit and the countryside is very varied with mixed crops (pumpkin, corn etc.) 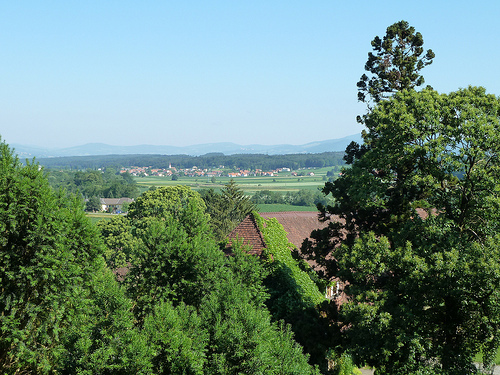 in the low land and forests on the hilltops. Downtown Sebersdorf consists of a fire station, a very nice lily pond and a bank with an ATM. The station is way out of town on the other side of the highway. We had a beer on the way back and directed a couple from Vienna who were wedding guests and who didn't know where the Schloss was. 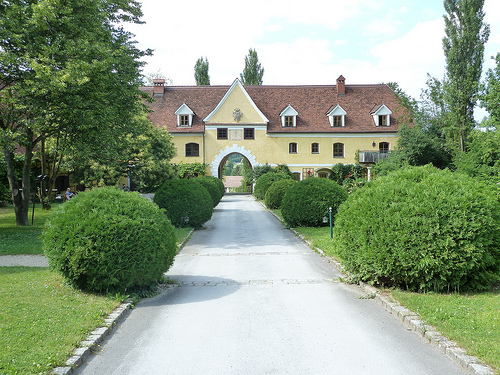 Family wedding and reception at the Schloss Obermayerhofen in the afternoon and evening. The chapel dates back to the 1600s. The dessert not only looked good - it was good. 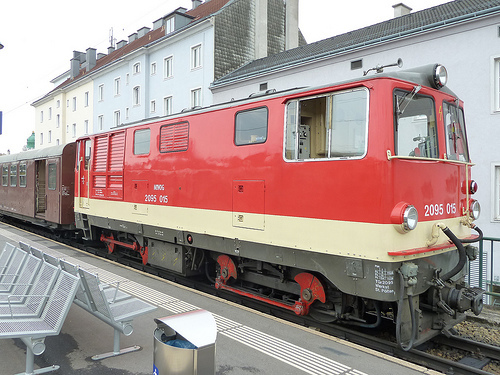 We had plenty of time this morning and got to Wiener Neustadt in good time to catch the 1200 diesel Wiesel to Bad Waltersdorf. This was the final leg of my journey which started in Frankfurt over seven weeks ago. 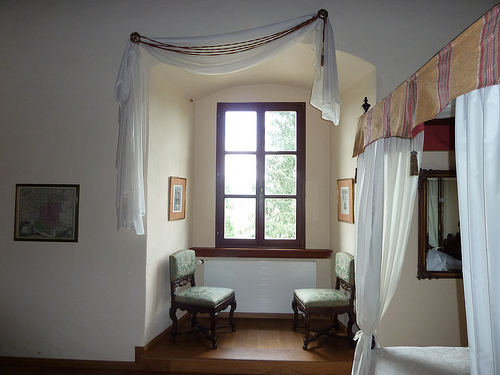 We settled in knowing that a taxi would be waiting for us in Bad Waltersdorf (not Sebersdorf) to bring us to the Schlosshotel Obermayerhofen. About an hour before we were due to arrive and there was an announcement to the effect that we were going to have to get out and get into a bus, then back into a train at Hartberg. Ah well, the best laid plans. The bus was not completely unexpected as there was something on the departure board at Wiener Neustadt which I didn't understand. The bus was almost as fast as the train by stint of driving through a team track, across a hotel parking lot and over a couple of sidewalks. We were only a couple of minutes late and the taxi quickly brought us to the Schlosshotel. 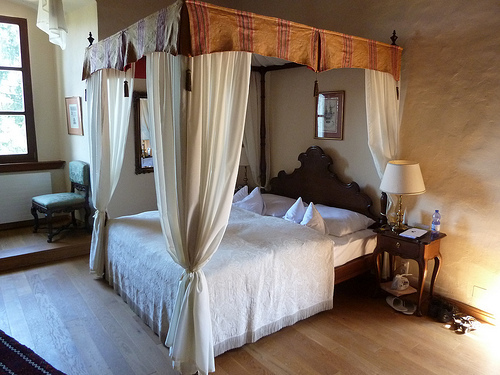 We have an enormous room with a four poster bed. 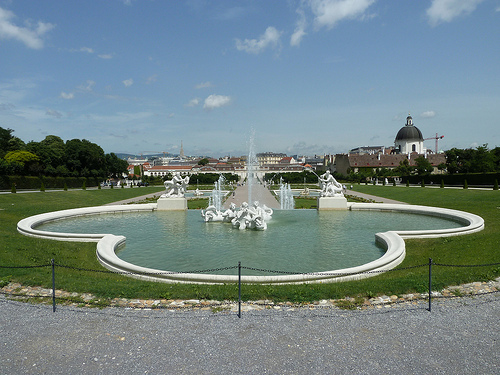 The grounds are extensive and many parts have been allowed to grow naturally. 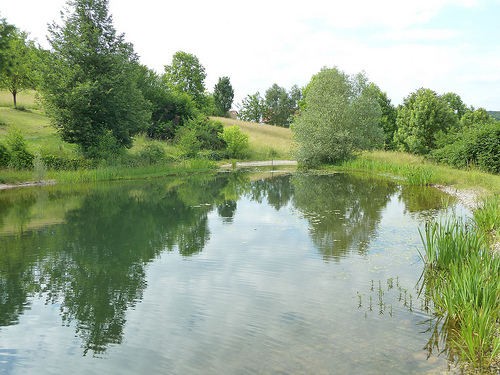 This pond had lots of frogs, bullrushes and small leaf water lilies. The entire hotel is devoted to the wedding group and we were very quickly introduced to some very interesting people. They came from all parts of the world – Philippines, France, Holland, Germany, Lichtenstein as well Austria. The party was a lot of fun with lots to eat and drink. There was an impressive selection of schnapps to try. Of the many highlights to this trip, today must rank as one of the biggest so far as railways are concerned. 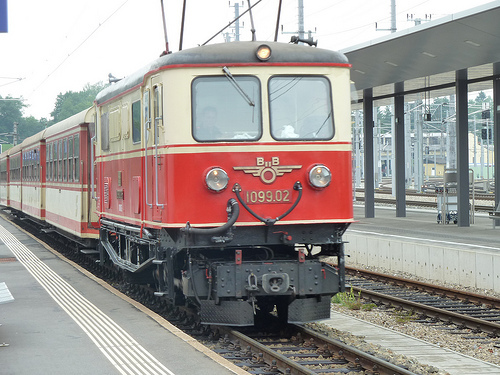 We took the U-bahn to Wien Westbahnhof and caught the Zurich-bound RailJet to St. Polten getting there on the dot at 0957. At Westbahnhof, the normal exit from the U-bahn was closed so we had a little difficulty in finding the station. First class in the RailJet is very smooth and pleasant. 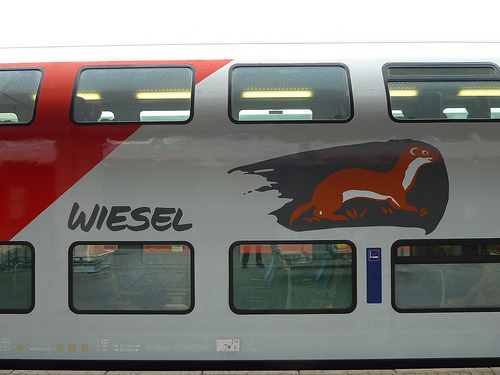 We were standing next to a double decker suburban set which are branded "Wiesel" - with a picture of a weasel on the side. 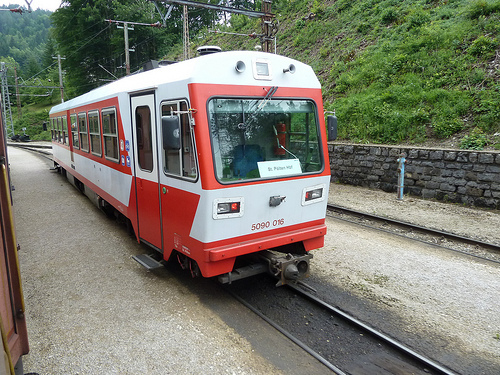 The narrow gauge (960mm) electric(6.6kv ac) line to Mariazell has caused the OBB some headaches in recent years. Two new electric multiple units were delivered in 1994 but the OBB had trouble with them and older equipment was having to stand in. There was also talk that the line, or part of it, would be converted to standard gauge. The latest information I had was five years old so I didn't know what to expect. 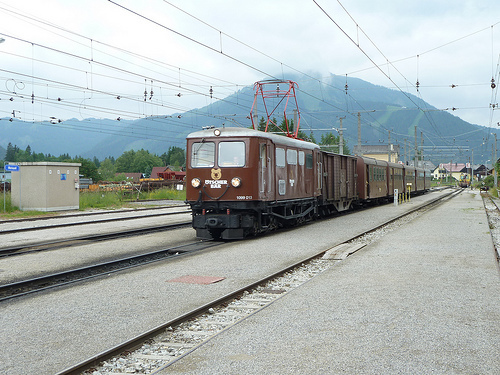 I was blown away when I saw our train backing into the platform - ancient passenger cars and an OBB narrow gauge 2095 class, built 1958-62, diesel hydraulic. The vacuum brakes had been coupled up and I nearly flipped when I noticed that the supposedly Bo-Bo trucks were using side rods. A 60 year old diesel hydraulic with side rods. Our Eurail Passes were not accepted on here so we paid cash. 55 euros for the two of us round trip for a five hour journey in splendid country seemed pretty good value. Things got even better when I observed the incoming train. The locomotive had side rods but it also had a pantograph and was one of the electric locomotives built for the line in 1909-1914. A centenarian! 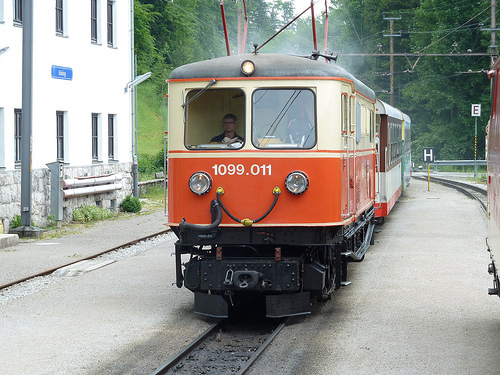 The incoming train at St. Polten is hauled by a 100 year old electric with side rods and a jackshaft drive gear. The first part of the journey is through farming country, some market gardening but some dairying with forests on the hilltops. We saw rabbits and deer in the fields which were covered with molehills and poppies. The further we went the steeper the valley sides and the character changed to heavily wooded, steeply graded, deep valleys with very little sign of human habitation. There were high alpine meadows with lots of wild flowers and, in places, ferns, heather, dog roses and moss. There was some beautiful karst scenery but only for a short period. 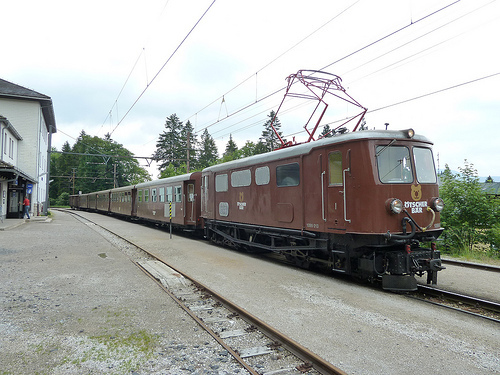 Our first meet was with a diesel railcar - no sign of the new electrics. At Boding we crossed another of the original electric locomotives. 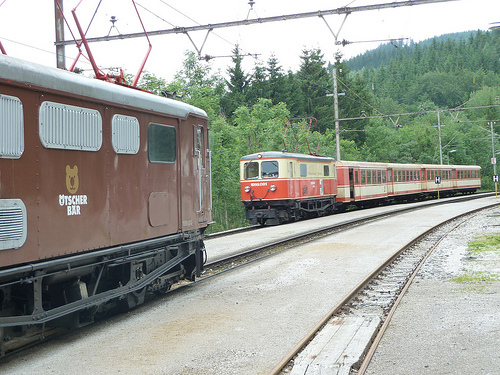 A centenarian electric passing a 60 year-old diesel. Crossing a loco hauled train at Boding. Arrival at Mariazell was exciting. We were on time at 1257 and a train was due to depart at 1300. There was another train with another electric locomotive, painted brown, waiting but this was reserved for a later train, so our diesel had to run round, couple up and do the brake test. It left three minutes late which was a pretty creditable performance. It was good to move around after 2 1/2 hours sitting on hard seats and we needed something to eat and drink. 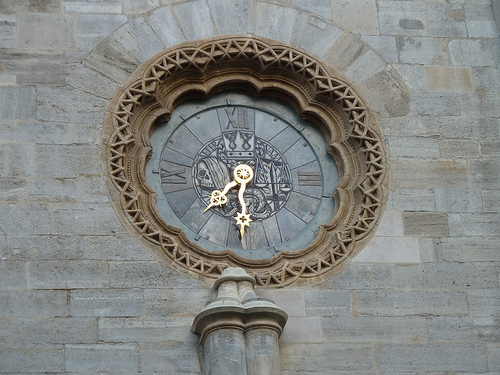 The town of Mariazell is a pilgrimage destination and this was not the pilgrim time of year. As we walked into town, all the cafes, restaurants and hotels were closed. We finally came to the centre to find the church which was surrounded by a mess of pilgrimage/tourist junk. We did find a cafe konditorei open and had lasagna and iced tea. Tie date nails are used in many places, this one was at Mariazell. We hurried back to the station, stopping only for some honey cake, to find the yard completely devoid of trains. A look at the timetable showed an arrival about five minutes before our train was due to depart so I got ready for a private run-past. Sure enough, the brown electric locomotive, reappeared, side rods flashing, and ran around so that we could achieve an on time departure. These old electrics seem to require a little coaxing to start. There is a bit of a pause and the humming increases as the engine moves gently forward. There is a fair bit of slack in the couplings so the train is started gently like a freight train in steam days where the strain is gradually increased as the slack is taken up one by one. There is some banging around of the cars and, when they are all going in the same direction, the speed is increased. Pretty soon the only noise that can be heard from the front is the whirring of the side rods. We had a sudden stop just before Boding and then drew gently into the station. It was announced that we would have a ten minute rest - while we were waiting for a late train to pass. An opportunity for another private run past. I got out to look at the old timer gently steaming from the roof. To top it off the errant train, when it arrived, was hauled by another centenarian. 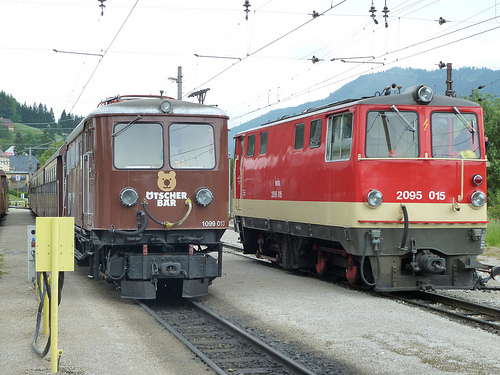 I was lost for words watching two centenarian electric locomotives pass each other on regular service trains. Running 20 minutes late, we passed two other trains hauled by these old electrics as well as a couple of diesel railcars. The track seems to be in pretty good condition which is a good sign. There are a number of bridges including several curved viaducts in both stone and concrete. Speeds are limited to 50 kmph for the electric locomotives and 60 kmph for the diesel locomotives. I didn't see any of the electric multiple units all day. The Mariazellerbahn also runs a steam locomotive and I saw a derelict one outside a roundhouse at Ober Grafendorf near St. Polten. In operation: 01, 02, 07, 08, 11, 13. On the St. Polten shop track: 04, 10, 14, 16. 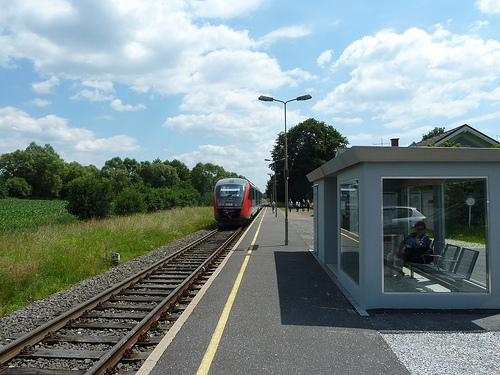 Although there was some smart station work we were unable to make up any time and we missed our planned connection back to Vienna at St. Polten. 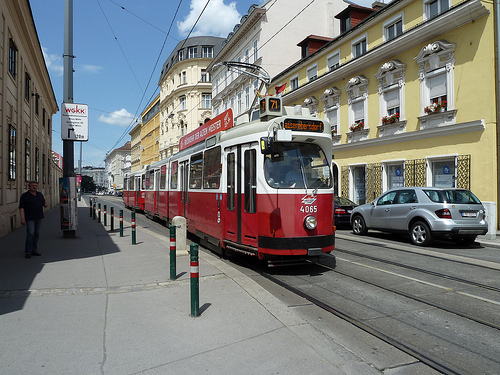 We caught a late running local that stopped at all stations to Wien Westbahnhof. 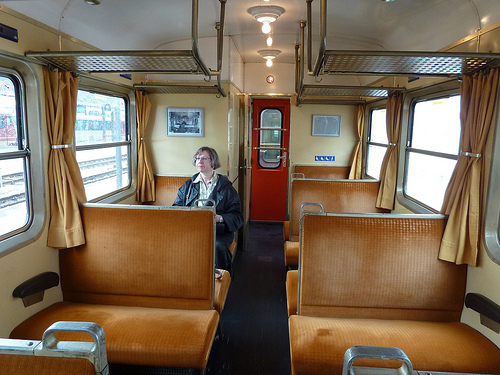 It was a comfortable double decker Wiesel that ran as smooth as silk on the excellent roadbed and there were good views from the top deck. We had an inkling for Wienerschnitzel and stopped off on the way back to the hotel. The place we had in mind was full and we were in no mood to wait - besides, there were lots of oriental tourists, all with guidebooks in their hands, so we went to a hotel restaurant. The schnitzel with potato salad was excellent. A good end to an excellent day. Click below to see my pictures in slide show format. As we were finishing breakfast I could see a tram stuck just by some track workers outside the hotel. It was there for about ten minutes seemingly unable to go ahead or back up. People started to get off and a number of trams were backed up behind. It might have hit some construction equipment. 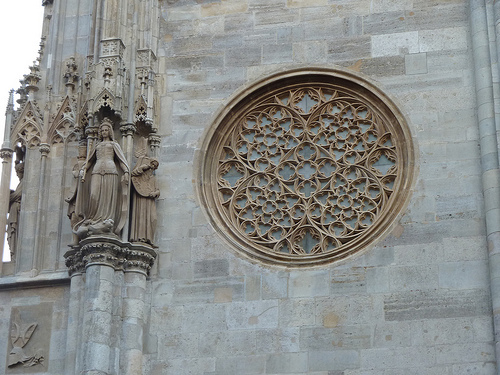 It started out pleasant today and we walked through the old town and enjoyed the architecture. Having bought 24 hour transit passes we took a 1 tram around the ring. 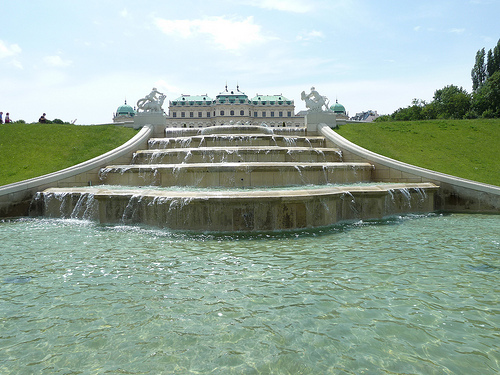 We stopped in at the hotel to grab rain gear then took 2 tram then a D tram to Schloss Belvedere. If anything, this is looking even better than when we were here before, the statues in the formal gardens have all been cleaned. 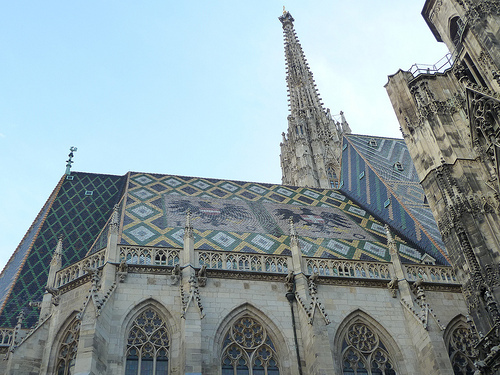 The views across Vienna were stunning. At the exit from the Schloss there is a strategically-placed sign for the Salm Brau next door. We have been here a couple of times before and have always found it reliable and good value. They brew the beer on the premises. I had a litre and Mary a half litre. We had spare ribs for two. The picture doesn't really do it justice because a third rack is hidden under the top two. The sauce was excellent and a little spicy. 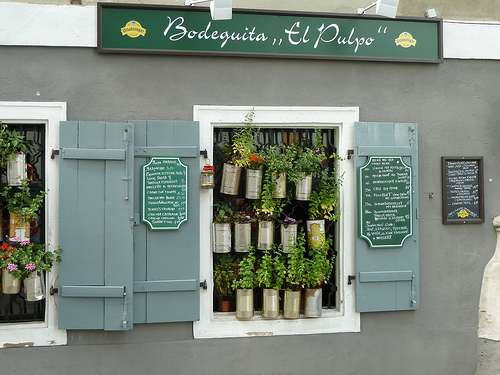 We thought of Pat - beer in litre mugs, barbequed racks of ribs and fries. 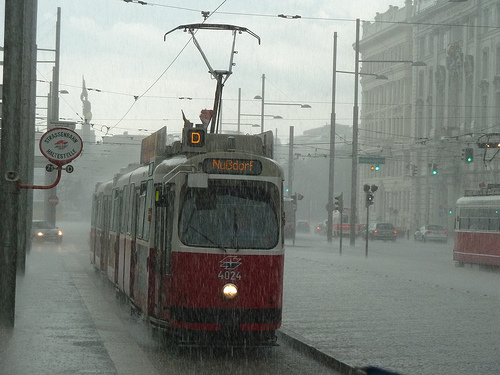 We took the D tram back into town and it began to rain very heavily indeed. 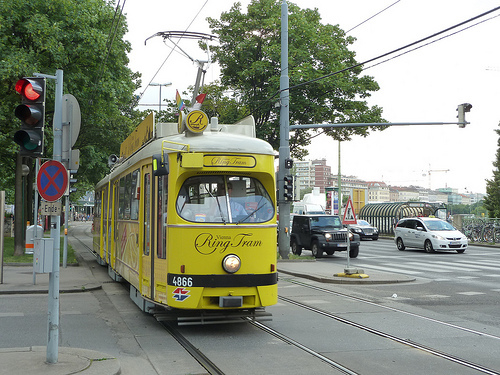 We got off at the Ring and intended to return to Schwedplatz. We managed a couple of stops then everything came to a grinding halt in the clockwise direction. There were trams backed up for as far as we could see. 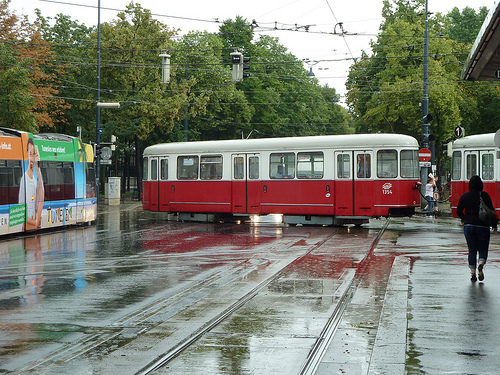 A man was gallantly wading through the water changing the switches by hand trying to extricate some trams with routes away from the Ring and short turning others. With nothing particular to do we just stayed in the dry watching the fun. The amazing thing about all this was that we could see blue sky in the distance so the storm wasn't very wide. We finally caught a tram back to Schwedplatz - it changed its destination a couple of times but we weren't bothered at all. By the time we got into the hotel the sun was shining brightly. We went out for a walk around the old town later. 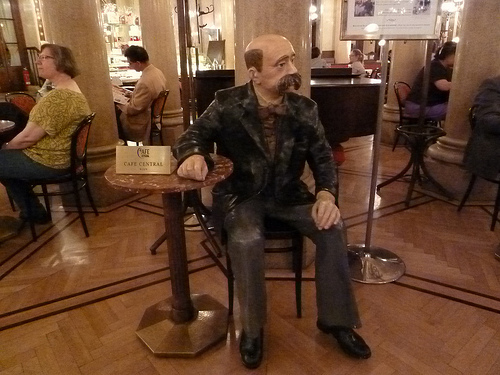 The ice cream parlors were doing a fine business and many people were sitting outside. We came across the square in front of the Rathaus which was given over to benches and chairs with a ring of drinks and snacks sellers around the outside. People were having a great time. We found the Cafe Central which we had visited last time and stopped for an Aperol Spritz. It began to rain and we went inside where a pianist was going full bore, including "Raindrops Keep Falling on my Head" which was very appropriate as the rain, thunder and lightning intensified. Many people came in from the downpour, including a couple that were wearing plastic shopping bags over their heads. We made our way back to the hotel in a slight rain. 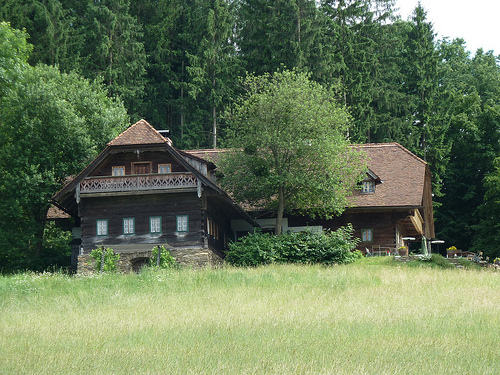 The Rathaus party was completely abandoned.